(Bloomberg) -- Democrats are busy finding new ways to tax the rich. 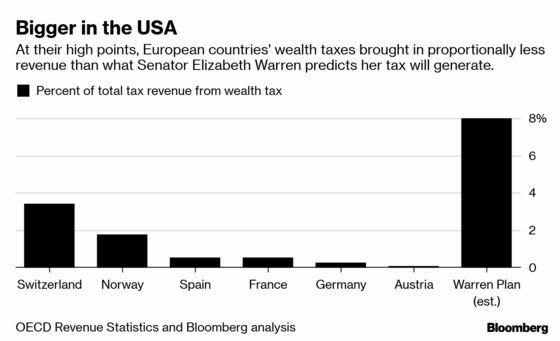 The most straightforward way to do that -- an annual tax on household wealth -- is an idea with deep roots in Europe that several 2020 hopefuls are hoping to import to the U.S. Yet of the 15 European countries that tried a wealth tax in recent years, only four still employ it. Most of those governments ultimately were underwhelmed by the amount of revenue raised and overwhelmed by the difficulty in collecting an accurate tax. Nevertheless, the idea is gaining steam among Democrats trying to unseat President Donald Trump in 2020. Senator Elizabeth Warren of Massachusetts was the first to come out with a detailed wealth tax proposal, and former Texas congressman Beto O’Rourke has expressed support for the concept. Warren wants to impose a 2 percent annual tax on a family’s wealth over $50 million, with an additional surcharge of 1 percent on wealth above $1 billion. She says her plan would raise $2.75 trillion over 10 years. Democrats, seizing on the argument that the 2017 Republican tax overhaul favored the wealthy, are staking out positions that will require upper-income filers to pay more. In addition to wealth tax proposals, several contenders have floated ideas to increase the number of filers eligible for the estate tax. Some 15 countries in the Organization for Economic Cooperation and Development, a group of economically advanced nations, had wealth taxes in 1995. Now, only four do: Switzerland, Belgium, Norway and Spain. Of the wealth taxes that remain, Switzerland’s is the most prominent. Its tax is levied by the canton, or state government, and at the city level. Each local government sets is own rates and includes most assets -- property, securities, vehicles, and valuables, such as jewelry. Spain briefly halted the tax during the financial crisis in 2008, then reinstated it in 2011, and increased the thresholds at which it applies. Similarly, Norway increased taxes elsewhere to generate more revenue and its wealth tax now only comprises 0.8 percent of its tax base. Germany, Sweden, the Netherlands, and Austria have all abandoned the policy, citing the high cost of implementation and the small revenue it generated. In France, the most recent country to back away from the idea, the wealth tax was estimated to bring in about 3.6 billion euros annually and cost the country about 7 billion euros annually from fraud as well as an eroded tax base caused by taxpayers leaving the country, according to research by Eric Pichet, a professor at the Kedge business school in France. In the first 10 years the tax was in effect, Pichet estimates that about 200 billion euros of capital left France or was never invested because entrepreneurs opted to put their money in lower-tax jurisdictions. Wealth taxes have also faced problems when they don’t tax all assets equally. In Germany, the wealthy shifted their investments out of stocks and bonds and pumped more money into property, which is taxed based on official values that are far below market rate. Once the wealth tax was repealed, investments moved back into securities. Both Spain’s and Norway’s taxes have some exemptions for the value of primary homes, which gave wealthy taxpayers a way around part of the wealth tax, according to Greg Leiserson, director of tax policy at the left-leaning Washington Center for Equitable Growth. That can artificially inflate the prices of the housing market, as well as make markets less liquid. Belgium could soon find that their citizens also prefer prefer pricey houses over investing in marketable securities. It became the lone European country to implement a wealth tax last year -- a 0.15 percent levy on financial accounts above 500,000 euros (about $563,000) for Belgian taxpayers living domestically and abroad. Because it relies on assets that are easy to value, Belgium’s plan will be much easier to police than one that includes all assets, but it will also generate much less revenue. Belgians could choose to hold their wealth in real estate or diamonds, rather than in stocks or bonds, legally reducing their tax liability. But none of the existing European plans would go as far as Warren’s proposal. If she is right that her tax would raise $2.75 trillion over a decade, that would mean it would account for about 8 percent of U.S. tax revenue. Comparatively, the Swiss wealth tax generates 3.3 percent of that country’s tax revenue. Tax administration experts say the only way to make a wealth tax work well is to have it apply to all assets. Otherwise, as many European countries have found, it’s too easy for rich individuals to organize their assets in a way that they minimize their taxes or escape the levy entirely. A wealth tax would require scores of new auditors and valuation experts at the U.S. Internal Revenue Service to ensure compliance, similar to how other countries have had to step up collection and enforcement efforts after enacting a wealth levy. The IRS already processes about 4,000 estate tax returns annually, which require the agency to verify the worth of lots of hard-to-value assets, including closely held businesses, art work and land. 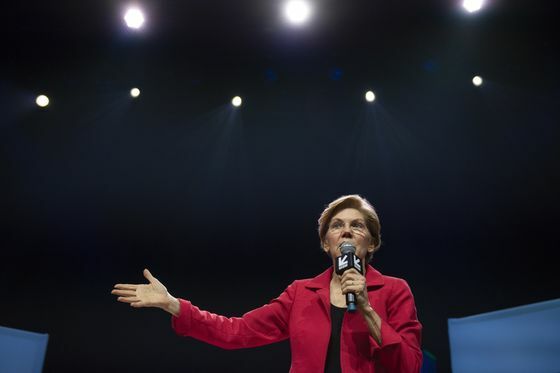 This would require the IRS to hire hundreds of new employees who would be responsible for processing and auditing about 75,000 wealth tax returns a year, according to estimates from Warren’s plan, an increase of 1,775 percent from the current work load. Implementing this tax would be a “big deal,” for the IRS, Leiserson said. It can be hard to put a firm value on rare art -- even harder if it’s stored offshore. In Switzerland, where the tax relies heavily on self-reporting, researchers have found that a 1 percent wealth tax lowers reported assets by 23 percent to 34 percent. A comprehensive tax will also face a fight from the housing, retirement, financial services and art industries. Warren’s plan relies on no class of assets getting exemptions to raise the promised $2.75 trillion. Yet groups representing home buyers, investors and collectors will push to have those assets excluded. A wealth tax could also be mired in legal battles. The central question would be whether it’s even constitutional. The Constitution prohibits federal taxes on assets. Several Democratic presidential candidates, including Vermont Senator Bernie Sanders and California Senator Kamala Harris favor an expansion of the estate tax. Critics say it will also push people to give up their U.S. citizenship in an attempt to avoid the tax, one problem that prompted France to repeal its wealth tax. But those fears could be slightly overblown, said David Shakow, a tax law professor emeritus at the University of Pennsylvania. “It’s a threat people make and it’s possible that people leave,” Shakow said, but not many end up doing so purely for tax reasons. But something as big as a Warren-style wealth tax could be the thing to convince the mega-billionaires to find a new country to call home, Baker said. Foreseeing that possibility, Warren’s plan would place a 40 percent exit tax on any U.S. taxpayer worth at least $50 million who renounces their citizenship. The growth of wealth inequality in the developed world has led to talk about wealth taxes, but few countries are implementing them, researchers from the Massachusetts Institute of Technology and two Swiss Universities found in a 2016 paper. “In fact, OECD nations have been moving in the opposite direction over the past decade, with most nations abandoning annual wealth taxation,” the paper said.